Junior ski racing builds lifelong skills and resilience. Do you have a child who loves skiing and wants to be a ski racer? We did. And without a doubt, I can tell you that junior ski racing turned our boys into fantastic skiers at a very young age. Today, tips on choosing a junior ski racing program that best suits your child and your family. Many resorts incorporate “just-for-fun” ski racing into their lessons. Gates, brushes, balloons, obstacles and the like are set up during lessons and kids run through the gates a couple of times to work on skills like looking ahead, reacting, anticipating and turning on demand. Some ski schools offer multi-week or season-long ski lessons that incorporate ski racing. Kids are grouped by ability and get consistent coaching. The focus here is on having fun and developing good, solid skiing skills. Pros: Your child has fun and participates in low-key competition while learning to ski better. Families on a ski vacation can participate in daily lessons. Multi-week programs offer an introduction to beginner ski racing and help kids determine if they’re ready for the next level. Cons: If your child is in a multi-week program and doesn’t like it, this can be frustrating. However, ski instructors are well-trained in how to make every ski lesson fun. My best advice is don’t sign your child up for a multi-week ski lessons unless he or she thinks it’s a great idea. Having friends in the same lesson works wonders, too. At resorts with either NASTAR ski racing or Epic Mix ski racing, instructors may run their classes through the gates as part of lessons. Since the courses are open to the public, parents and families can race each other on demand. Just show up and pay the fee. Pros: As long as the course is open, anyone and everyone can race. The courses are timed and the dual, side-by-side set up encourages happy competition. If your child does well, he or she may qualify for the national finals in each league. Parents can qualify, too. Cons: These programs are pay-to-race. Determine the price and where and how you pay to participate before going to the course. Recreational ski racing leagues are the next step up. These leagues are not learn-to-ski programs, although your child will graduate with great skills. While programs vary, here’s what I would look for. Weekly training with a coach and weekly races throughout the ski season. In our local Buddy Werner League, kids ski with their coaches in the morning and race in the afternoon (or vice versa depending upon age group). The season culminates with a regional race against teams from other resorts. An emphasis on building strong skiing skills. Moderate competition. The pressure should not be intense and the overall emphasis should be on fun. Skiing with friends and coaches is a big benefit of junior ski racing. Pros: Your children will build amazing skills while skiing with friends. Parents reap the benefits of adult ski time, or time with other children. Participation in a recreational league may spark a desire to move onto more competitive junior ski racing. Or, it may be something your child outgrows. But the skills last forever. Cons: Ski racing requires a commitment. While your child won’t be “benched” for missing practice, if you can’t commit to the full season, it may be a waste of money. This commitment also requires that your child have a certain degree of motivation and stamina. Most leagues are busy, full day affairs that start soon after the lifts begin turning. While all children are different, I don’t recommend recreational league ski racing for kids under 6. USSA racing is the big league, with a 100% focus on racer development. The level of competition is high. Training is a commitment and if your child dreams of competing in the Olympics, he or she may love it! Competitors are grouped by age level and racing clubs often travel to other resorts to compete. As your children become teens, they have additional competitive options including high school ski racing and ski racing boarding schools. Pros: Because these ski racers share a passion, your kids will make friends and always have ski buddies. Ski racing builds resilience and determination. Standing in the gates at the top of a race course is not easy. But it is a fantastic way to develop mental strength. If you child loves ski racing, the experience can pay off throughout her life. Hanging out with friends is a big benefit of junior ski racing. Cons: Competitive junior ski racing is a time and financial commitment that impacts the entire family. Training, travel, competition, equipment and clothing all take their toll. Parents need to be willing to cede control to the coaches and roll with both triumph and disappointment, always remembering that the experience is about the athlete, not themselves. Otherwise, (and we’ve seen this), what should be a positive experience for a youthful ski racer can quickly become negative. Great article! Out east in Maine our two teenage boys race on their public school alpine team. Not all schools have an alpine race program of course, but we find it is not such a time drain that USSA is but still gives our kids a good opportunity to race. 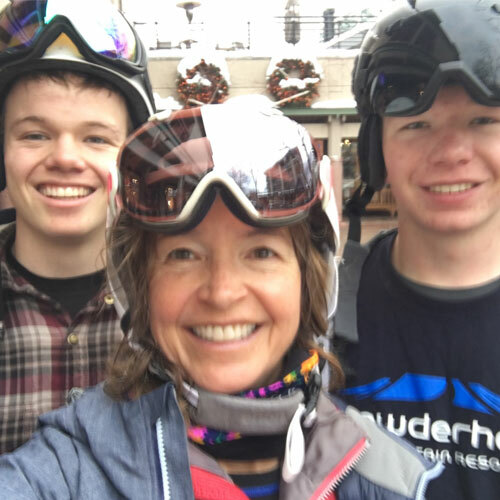 Elite racers certainly need the USSA training and exposure to take their skiing to the next level, but our kids like the fact that get good racing competition on weekdays and their weekends are free to shred the mountain with the family. Thank you for correcting me. Because I was focused on younger kids, I didn’t even think about school teams. You make some great points.